Last month I had the opportunity to visit House Spirits Distillery in Portland, Oregon, tour the facilities with head distiller, Andrew Tice and get to know founder & distiller, Christian Krogstad – one of the pioneers behind America’s craft distilling revival. House Spirits Distillery, a forerunner in Portland’s craft distilling community, is now in their 12th year of operation. And after leading the development of the city’s first Distillery Row in Southeast Portland, making the move into a shiny, new $6 million production facility with tasting room last November, they’ve solidified their position as the largest distilling operation in the Pacific Northwest. The new 14,000 square foot space includes a 3,000-gallon copper and stainless steel whiskey still, one of the largest on the west coast. The new production facility allows for them to distill six times their previous distilling capacity and they have more than doubled their production of their flagship spirit, Aviation American Gin. They’ve only been in their new digs for about eight months now, but according to Krogstad, demand for product has them already outgrowing the building. They may soon have to look for another space entirely for the different legs of production. But in the meantime, they’re running a tight ship, producing excellent products and having fun while doing it. After having spent some time with Krogstad, I can’t help but think that the convivial atmosphere around the House Spirits Distillery is in large part due to his leadership. A Seattle native, Krogstad spent some formative years post college in Hawaii where he first got into home brewing. After settling in Portland in ’91, initially drawn by the city’s craft beer boom and working in that industry for 12 years, he then looked to craft distilling as the next big thing. Observing the success of the microbrew scene informed his decision to test the industry waters. But it was the resurgence of craft cocktails and ultimately his partnership with local bartender Ryan Magarian that helped to launch Aviation American Gin as we know it, designed with cocktails in mind. As a longtime fan of Aviation Gin (and after having celebrated their 10th birthday in July with an original cocktail), I was eager to learn about and try all the other products House Spirits is producing. Volstead Vodka, cheekily named after the father of Prohibition, Andrew Volstead, was also created with cocktails in mind. Made with pure Cascade mountain water and filtered through charred coconut husks, this vodka went on to win the 2013 Gold Medal at the 2013 SF World Spirits Competition. 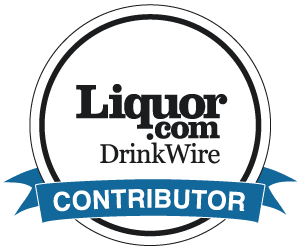 I LOVE a coffee liqueur and House Spirits Coffee Liqueur is a lovely take on the category. Using pot-distilled rum made with Barbados molasses and then blended with cold pressed coffee from Portland’s famed Stumptown Coffee, this stuff was made to be sipped on its own, but would also be fantastic in a cocktail. Aquavit, a traditional Scandinavian spirit, usually distilled from grain and flavored with botanicals, namely caraway seed, is having a bit of a renaissance. Many bartenders specializing in craft cocktails have discovered it to be as important as a base spirit as vodka or gin. Coming from a desire to honor his family’s Scandinavian heritage, Krogstad had House Spirits produce aquavit early on in their development. They now produce two expressions, the unaged Krogstad Festlig Aquavit, made with only two botanicals, caraway seed and star anise and Krogstad Gamle Aquavit, aged in premium French oak wine barrels for 10-12 months, available once a year. Rounding out House Spirits’ portfolio is the fantastic Westward Oregon Straight Malt Whiskey launched in 2013. Using locally sourced barley and then fermented with ale yeasts, this malt whiskey, inspired by an Irish style of whiskey making, then has to spend two and a half years in new American oak barrels. Head distiller, Andrew Tice, had me taste the whiskey wash, also known as distiller’s beer – essentially the beer that is to be distilled into whiskey. This normally is not very tasty, tends to have off flavors, and no one would voluntarily drink this unless they were in the business of distilling. But Westward Whiskey’s distiller’s beer was incredible. Like a Saison ale – earthy, fruit forward, nutty, complex and extremely quaffable! Maybe it’s because both Krogstad and Tice have craft brew backgrounds or they’ve just hit on something magic in the process, but if they ever want to go back into the beer business they may have something here! In any case, this quality wash also creates a beautiful whiskey. And the new facility will allow for even more of it to be produced and aged. They predict 1000 barrels of the stuff in their first year. To go behind the scenes on my tour of House Spirits Distillery, check out the Snapchat video I made that day below. Many thanks to Christian and Andrew and everyone who helped facilitate this amazing experience. I highly recommend visiting their Tasting Room the next time you’re in Portland. The space is beautiful, the people are lovely and extremely knowledgable and the spirits (and cocktails!) are top-notch. More info here. Exciting! They are really going for it with this operation. I have been wondering what the place was like. I feel like I was there. Mmmm. Not close enough. Need to visit!